HydroEye is a patented nutritional formulation that works from the inside out to provide continuous support for dry eyes. HydroEye, the focus of clinical research, delivers a proprietary blend of omega fatty acids (GLA, EPA and DHA), antioxidants and other key nutrients that work together to support a healthy tear film and soothe the ocular surface. A leading, doctor-recommended dry eye supplement that provides continuous support for dry eye discomfort due to: age, tear deficiency, contact lens wear, computer use, frequent flying, LASIK surgery, and other causes. New users should try HydroEye for 2 months before evaluating comfort, though benefits may begin much sooner. HydroEye is covered by a 60 day money-back satisfaction guarantee. Patented oral formula works from the inside out to help promote healthy tear glands, and support normal tear production. Much more powerful than flaxseed oil or fish oil alone, HydroEye provides the unique omega fatty acid, GLA, from black currant seed oil – which is not easily obtained from the diet, plus omega-3 EPA and DHA from highly pure USP®-verified fish oil. GLA has been found to play a key role in dampening dry eye irritation in multiple clinical studies. GLA is not found in flaxseed or fish oil. View studies on GLA’s role in dry eye. Offers uninterrupted relief with continued use; results typically experienced within 30-60 days. Money-back guarantee! Try HydroEye risk-free for 60 days. Replaces or reduces the need for artificial tears for most users. Made from premium ingredients in NSF®-Certified facilities. Read about the scientific rationale behind this product in the HydroEye monograph. Note: use with anticoagulants may increase their effect and prolong prothrombin time. Pregnant or lactating women and individuals with known medical conditions should consult a physician before using. How long does HydroEye take to work? HydroEye offers long-lasting effectiveness with continued use. Results are typically experienced within 30-60 days. HydroEye is an oral formulation that works from the inside out to target the root causes of dry eye. Unlike topical products like drops and artificial tears, HydroEye does not require frequent re-application throughout the day. HydroEye provides uninterrupted relief within 30-60 days. HydroEye may be combined with artificial tears, punctum plugs or the medication Restasis®. Because HydroEye is an oral formulation that targets dry eye internally, it works by a complementary mode of action to these topical products. However, most users find that HydroEye provides adequate relief within 30-60 days. Can HydroEye be taken with Coumadin or other "blood thinning" medications? A study published in 1994 reported that supplemental GLA lowered triglycerides, increased levels of "good" HDL cholesterol and prolonged the time it takes for blood platelets to clump together- factors which may contribute to cardiovascular health. Platelets in the blood have a sticky surface which allows them, along with other substances, to form blood clots when bleeding occurs, a process called coagulation. Since platelets are involved in the process of forming clots, the GLA contained in HydroEye could theoretically increase the effects of anti-coagulant and anti-platelet medications such as Coumadin, Plavix or aspirin. If you are taking "blood thinning" medications, your physician can perform a Prothrombin time, INR, or bleeding time test to measure how long it takes blood to clot. This will ensure that HydroEye can safely be added to your current drug regimen. How does HydroEye differ from flaxseed and fish oils? 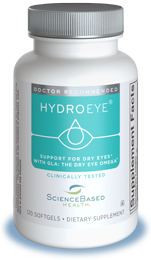 HydroEye provides the same omega-3s as flaxseed and fish oil. HydroEye now features EPA and DHA from highest-quality, USP verified fish oil. However, only HydroEye provides GLA (gamma linolenic acid). GLA effectively promotes the body's production of anti-inflammatory compounds. Both GLA and the omega-3 from fish oils have anti-inflammatory actions, but only GLA has been clinically shown to decrease dry eye symptoms. Additionally, neither fish nor flaxseed oils contain other important nutrients that are included in HydroEye: vitamin B6 and magnesium to promote fatty acid metabolism, vitamin A to support the production of mucin in the tear film, and the antioxidant vitamin C to help fight the free radicals associated with inflammation. What’s the difference between the EE and TG forms of omega-3s? Why does it take more than just fish oil to combat dry eye? Although discussion of fish omega forms has centered on their use for dry eye, research has not yet shown fish omegas to be a lead dry eye player. Instead, they are a useful adjunct to GLA, an omega that has demonstrated significant dry eye benefit in three clinical trials. When the fish omega EPA is paired with GLA, they reduce inflammation in a complementary fashion. HydroEye features GLA plus USP-verified fish oil that, along with other important nutrients, fights inflammation and supports all three layers of the tear film. HydroEye's unique, patented formulation features a balanced blend of omega fatty acids, which have been well established to provide support for dry eyes as well as other health benefits. GLA, a key omega fat in HydroEye, has been well studied and safely used for over 20 years. GLA has gained attention in recent years for it's role in dampening inflammation, an underlying cause of dry eye. Read about studies on GLA for dry eyes . HydroEye also contains omega-3 EPA and DHA from the highest quality, USP-verified fish oil. EPA and DHA provide additional anti-inflammatory support as well as benefits for macular and heart health. HydroEye has also been found to raise levels of lactoferrin in LASIK patients. Read summary of study. Additionally, HydroEye provides antioxidants and other key nutrients that support all 3 layers of the tear film. View the Dry Eye Product Comparison Chart. HydroEye works from the inside out to reduce inflammation and support tear production. HydroEye and Restasis are complementary and may be taken together.